If you have a BeagleBone and would like to start using it, or if you are interested in programming small systems that use Linux, this guide is for you. The focus is on getting a development system up and running so you can write and run your own programs on the 'bone. I've tried to include some of the whys behind the how-tos so you understand not just how to do it but why it works. 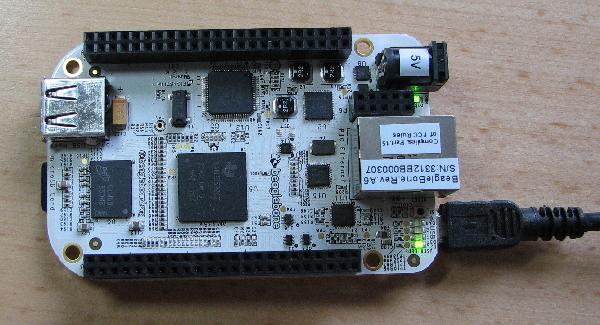 The BeagleBone is a single-board computer that comes with a mini-SD card containing an Ångström distribution of Linux. The Ångström distribution is tailored for use in small systems. Unlike a PC, the 'bone doesn't come with a keyboard and display for executing commands and running programs. So how do you load and debug programs? One way would be to create a mini-desktop system by attaching a USB hub, keyboard, mouse, and a USB display like those from Lilliput. But most small systems don't need all of that hardware. Another option is to create a development system by linking the 'bone to a PC. You can use the PC's keyboard, display, and other resources to write and compile programs, transfer the programs to the 'bone, and debug. From a terminal application on the PC, you can send commands to execute on the 'bone. When debugging is complete, you can detach the 'bone from the PC and run your application on the 'bone as a standalone system. 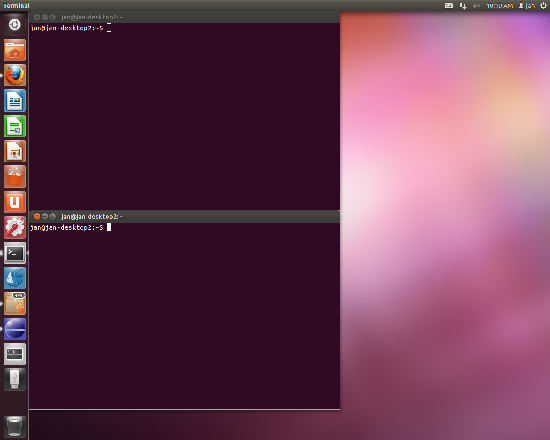 This tutorial assumes you have a PC running Ubuntu or another distribution of Linux. If you want to stick with Windows, see adafruit learning system's instructions on how to set up the BeagleBone on a Windows PC. This tutorial uses two terminal applications on the PC, one to enter commands on the desktop system and one to enter commands to send to the 'bone. To open a terminal application on the PC, click the dash home button (the Ubuntu logo) in the upper left, enter terminal in the search box, and press Enter. A window will open with a text prompt. We’ll call this screen the desktop terminal. To power up the BeagleBone and boot Linux, insert the provided mini-SD card in the receptacle and use the provided USB cable to attach the 'bone's USB device port to a USB port on your PC. The USB device port's receptable connects to an on-board USB hub with two downstream ports. Each of the hub's ports connects to an on-board USB device. The PC provides power to the 'bone and enumerates the devices to find out what they are and what drivers to use to communicate with them. The ports will likely be the only USB virtual serial ports and will be at /dev/ttyUSB0 and /dev/ttyUSB1. If you see more than two ports, detach the 'bone’s cable and list the ports again. The ports that disappear from the list are the ones that belong to the 'bone. The FT2232C's serial ports connect to asynchronous serial ports on the 'bone's processor. As you'll see, you can use one of the ports to communicate with a terminal application on a PC. The other port can support JTAG debugging. The 'bone's other hub port connects to a USB port on the bone's processor, which can emulate the functions of a variety of USB devices. In the example above, /dev/sdb is the device node and /media/BEAGLE_BONE is the device's mount point, where you can access the emulated drive's files. To open a terminal application for communicating with the 'bone, right-click in the desktop terminal’s window and click Open Terminal. A new window will open. We’ll call this the beaglebone terminal. The screen command creates a virtual terminal for communicating with the device connected to the USB virtual serial port at /dev/ttyUSB1. 115200 is the baud rate for the serial interface that connects to the 'bone's processor chip. If you want to close communications with the 'bone, press Ctrl+A, k and answer “y” to Really kill this window (y/n)? Once you’ve logged in, if you close the screen, reopen it, and press Enter, the prompt will appear. You don’t have to log in again until you reboot the 'bone. Commands you enter in the beaglebone terminal will execute on the 'bone. The USB device port on the processor can also function as a USB/Ethernet bridge. You can use the Ethernet bridge to communicate with a PC instead of using a USB virtual serial port. You’ll likely see entries for eth0, the PC’s Ethernet interface, and lo, desktop loopback. In the response, you should see g_mass_storage, which is the Linux-USB File Storage Gadget driver. You should see g_ether, which is the Linux-USB File Storage Gadget module, in the list. The g_mass_storage module should be absent. inet addr is the IP address the PC uses to communicate with the 'bone. In the example above, the address is 192.168.7.1. The USB/Ethernet bridge can communicate with the PC using SSH, which is a network protocol for secure data communication. where 192.168.7.2 is the 'bone's IP address. The -X option enables X11 forwarding for graphical user interface support. Press Enter or enter the password and you should see the beaglebone prompt. My tutorial Using Eclipse to Cross-compile Applications for Embedded Systems shows how to compile and run your own programs on the BeagleBone. I wrote the tutorial for the BeagleBoard-xM, but the instructions for the 'bone are the same except that in Part 4, you don’t have to set a static IP address. If you want to reload the mass storage device on the 'bone, you need to unload the USB ECM gadget module and reload the Linux-USB File Storage Gadget module. Because you'll be unloading the Ethernet driver, you need to be connected to the 'bone using the screen command. You should now be able to access the emulated drive at /media/BEAGLE_BONE on the PC again.